For Bob Hoffman, it’s not what’s inside that counts so much as the case that holds it. The Arlington resident, who goes by “Hoff,” is the proud owner of what is believed to be the world’s largest collection of harmonica cases, topping 500. Each one is a handcrafted piece of art. He’s got cases made out of bicycle parts, dominoes, Legos, zippers, a Civil War-era gunpowder tin and a real alligator head. There are cases shaped like a necktie, a teapot and a mini-pinball machine. One was 3-D printed. Others double as a whiskey flask, a bong and a kaleidoscope. A retired lawyer who worked for AARP, Hoff started playing the harmonica in his mid-50s. Even though it’s a small instrument, he says carrying it in his pocket felt clumsy and inaccessible. So he commissioned a bead artist he met at the 2004 Smithsonian Craft Show to make a special case that hung around his neck. 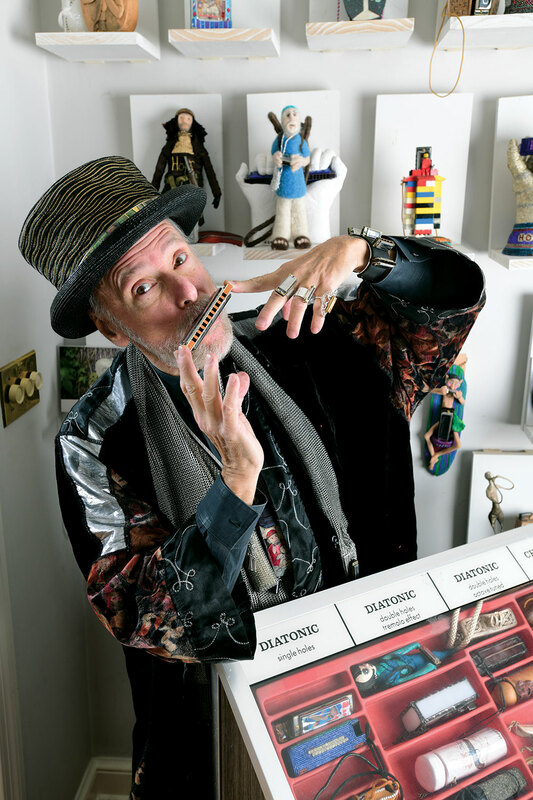 Thus began nearly two decades of collaborating with artists—whom he’s discovered at art festivals, craft shows and via referrals—to create more than 525 (and counting) personalized harmonica cases. In that time, the collection has garnered a modicum of fame, having been featured on NPR and the BBC. In 2011, it was displayed at the now-defunct Artisphere in Rosslyn. “It’s given me a wonderful hobby…or obsession, if you listen to my wife,” Hoff says. The quest for more is keeping plenty of artists busy. Hoff estimates that he has another 25 to 30 cases in the works. Of course, he does have his favorites. The case he wears most often features a cross-stitched image of Hoff with his then-6-month-old grandson, Ethan (now 6), playing harmonica together. It was created in 2012 by local fabric artist Jamie Langhoff, whom Hoff first encountered at D.C.’s Eastern Market. Someday we’ll all be blowin’ in the wind. Upon his death, Hoff plans to donate a majority of the harmonica cases to free museums in New York, D.C. and Vermont, where he spends his summers. Columbia Pike resident Matt Blitz is a journalist for national and local publications covering history, travel, science, and government. He’s also the head of the Atlas Obscura Society D.C.